© 2012. 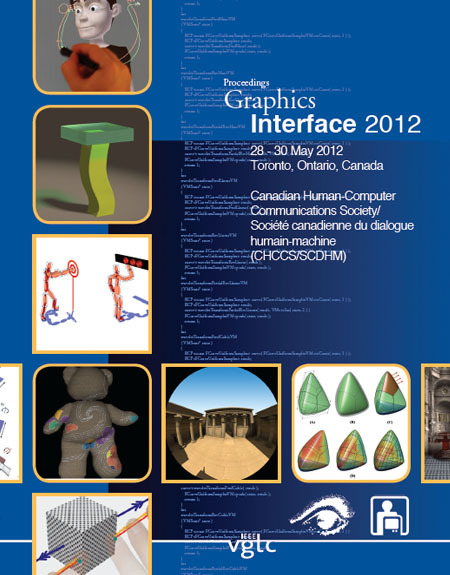 Published by Canadian Human-Computer Communications Society. ISBN 978-1-4503-1420-6. The thirty-eighth Graphics Interface featured two invited speakers: Hans-Peter Seidel, Max-Planck-Institut für Informatik, and Chris North, Virginia Tech, both well known for their exemplary contributions to their disciplines. Nadia Magnenat Thalmann, Nanyang Technological University and University of Geneva, and Daniel Thalmann, Nanyang Technological University in Singapore were this year’s co-recipients of the Canadian Human-Computer Communication Society’s Achievement Award. This year’s winner of the Alain Fournier Award is Gordon Wetzstein, and of the Bill Buxton Award is David Dearman.